The team at Monash University in Australia, led by Professor Peter Gibson, developed the low FODMAP diet. It wasn’t until then did they prove that FODMAPs could trigger symptoms of IBS and research acknowledge that diet could be responsible for IBS symptoms. In turn, limiting dietary FODMAPs became an effective treatment in susceptible people, for treating their symptoms of IBS. The FODMAP acronym was coined to classify groups of carbohydrates (sugars and fibers) found in foods and beverages, that are similar in length and structure. These, “short-chain” carbohydrates have been shown to be poorly absorbed in individuals living with digestive sensitivities, including Irritable Bowel Syndrome (IBS), and resulting in a common set of gastrointestinal symptoms including abdominal pain, bloating and gas, constipation and/or diarrhea. What exactly does FODMAP stand for? 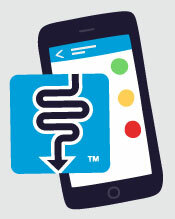 Monash University, Medicine Nursing and Health Sciences has created an up-to-date smartphone app which maintains a current list of FODMAP containing foods. It will provide the most current information of FODMAP. We maintain a FODMAP Registered Dietitian Registry who can help patients administer the low FODMAP diet. EnteraGam® is a prescription medical food product for the management of IBS-D that may significantly reduce stool frequency and the number of days with GI-related symptoms. It works by targeting multiple factors in IBS-D. Research shows that this medical food helps the body deal with mild inflammation in the lining of the intestine may contribute to IBS symptoms. IBgard® is a non-prescription medical food that uses targeted technology to deliver peppermint oil directly to the small intestine. Recent research data has shown favorable results in a combined group of IBS-D and IBS-mixed patients at relieving symptoms similiar to an anti-spasmodic.